It is used as weapon of war and as an important component of offerings. It is often carried by Shiva. It may be held by the fire god Agni or may issue from his body. It is made of small wooden handle topped by strong and sharp metal hook. The handle is sometimes in the form of Vajra. It is the attribute of many tantric deities. When the goad surmounted b a Vajra, it is called Vajrankush. AKSHAMALA (Rosary) It is a symbol of the never ending cycle. It is string of beads. The beads are of a kind of seed of dried fruit. It may be made of other material also such as crystal. In Buddhist Tradition, it is a special symbol of Avalokiteswar. It is also symbol of Prajnaparmita, Chunda, Vasundhara. In Hindu tradition, Brahma, Shiva, Ganesh and Saraswati also carry it. BHUMBA Water is perhaps the most important both in Hindu and Buddhist ritual and is always present on the alter in a costly pot or in some other container. The pot whose shape is just like a flat shape jar with a pipe to bring out the water from the pot and which is richly decorated with precious stones and metal is known as Bhumba. The hell representing the female aspect stands for "prajna" or "wisdom". This is held in the left hand Dorje held in the right and they are always used in combination during the religious ceremonies. So Belt & Dorje are inseparable ritual objects and two together lead to enlightenment. BINA (LUTE) It is stringed musical instrument. It is a favourite instrument of Saraswati, goddess of wisdom, learning and arts. Chaitya or the Stupa, which represents the Buddhist Universe, is the Buddhist sanctuary, sometimes square and sometimes round, with spires or steps on the capital. Each spire or step represents a heaven, the uppermost portion being a point which is supposed to be the highest peak of Mount Sumeru, a mythical mountain whence the Buddhichitta loses itself in sunya. On the four sides of the chaitya the figures of your Dhyani Budhas Akkshobhaya. Ratna Sambhav, Amitabha, Amoghasiddhi are placed. The place of Vairochana is in the centre. In some Chaitya Vairochana is placed to the east along with Akshobhaya. CHAKRA (Wheel) It appears often above the image of deities. In Buddhist Vajrayana tradition symbolizes complementary of opposites. Both Sambar and Shiva have the crescent moon as their hair dress. CHHATRA (Parasol) It is a symbol of Buddhist goddesses such as Pancharaksa, Usnisasita. It protects from the evils. It is one of the eight symbols of good luck. CHAMARU (Fly Whisk) It is often held by supporting Hindu deities and semi divine beings and attendants. It is one of the eight symbols of good luck. DIPA (Lamp) It is sacred lamp fed with Ghee (butter). People offer it to the Gods and Goddesses. It is a pot made of metal for burning incense which is to be offered to the gods and goddesses. It is a small double drum with a leather string tied over the narrow middle part of it, where knotted, wooden or bone ends make of rattling sound on the drum's memeberances, when swung. It is appeared along with the trident (Trisula) in association with Shiva cults. The tantric symbol known as the Damaru is a hand drum made of two half skulls. DHANUSA (Bow) Dhanusa is a bow. It is generally carried in the left hand. It appears with the tantric deities such as Marici, Kurukulla. With the bow and the arrow Marici, inflicts pain to the Maras and wicked beings. Like Bajra and Chanta, bow an arrow symbolize the complementary of method and wisdom. KALPANA (Half Skull) For containing blood in tantric ritual. Held by Kali and other manifestations of Shiva Sakti, by Mahakala and other guardian deities and their Dankinis. Kapala is made of severed head of a man or the cup made of a skull, or a bowl. The skull cup is of two kinds, when it is filled with blood it is called Asrkkapala, and when with flesh it is called Mamsa kapala. It is used inTantric ritual. The deities are appeared to partake of the blood or the flesh of the demon carried in these cups. It signifies the victory of Buddhism. A staff with a tapering end used as a weapon in close combat. It is symbol of Vishnu. A club made of human bone with a skull on the end of it is carried by Devi, Durga, Kali and Bhairab. Ghau is a portable shrine in which an image of the owner's personal deity (Ishta Devata) is kept wrapped in silk cloth. Most Tibetans used Ghau at home and during traveling. At home, it is kept on alter but when traveling it is fastened at the cross belt. Generally, Ghau has trefoil shapes to and a window in the middle through which one can see the personal deity. Ghau is made of two parts which fit together to form a box. The back is usually left plain and the front is richly decorated. A trumpet is made of human thigh - bone. It is a ritual object used at the time of tantric ceremony and blown to drive away evil spirits. Damaru goes side by side which gives "Magical Music" for the celestial journey. Music is considered to be similar to a mantra. In Hindu tradition, Kalasa contains the primeval water carried by Brahma, the creator. In Buddhist iconography, the Kalasa helds Amrit, the water or the elixir of immortality. It appears with Padmapani. It is also one of the auspicious sign and symbolizes plenty among the eight Astamangalas. A weapon symbolizing severance of all material and this worldly bond held by Mahakala and by the Dankinis embracing the Dharmapalas and the Yidams such as Yama and Yahantaka. It is a symbol of enlightenment, used to destroy ignorance, the enemy of liberation from the bonds of worldly attachments, hence of continuous misery. It is a special symbol of Manjushree. The sword in the hand of Manjushree is called the Prajna Khadga or the sword of wisdom which is believed to destroy the darkness of ignorance by the luminous rays issuing out of it. It is a kind of club, made of bone of forearm or leg, sometimes of wood and metal. 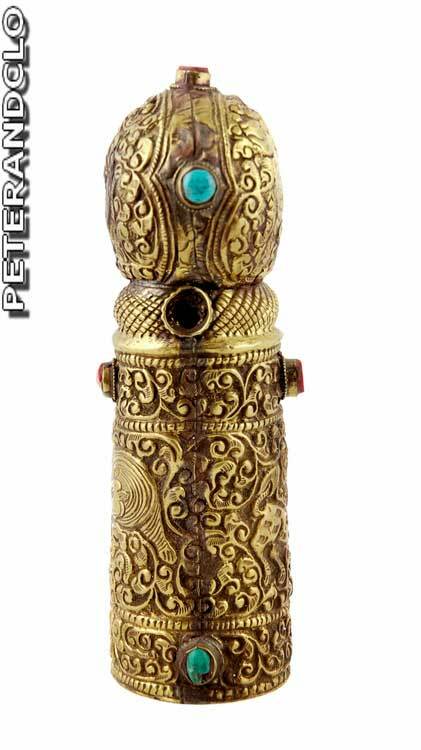 It is a magic wand held by tantric deities, Dakinis and Vajrayana saints. It is generally surmounted either by Vajra or Kapala or the Trishula or the banner or all of them. In any case for a Khatwanga the skulls are necessary and it will be so called even if nothing else in present. It is a symbol of Shiva. In its usual form it is a cylindrical piece of stone or wood standing on its narrow end. The top is usually rounded. The lingam is frequently founded in combination with the Yoni, a plate like disc with a drain, which supports the lingam. Mandala (Literally meaning a circle) is a Tantric meditation device. It is a visual aid for concentration and introvertive meditation leading to the attainment of insights and to activation of forces culminating in "Siddhi" supernatural forces. The Mandala is the graphic representation of this process. It is not only theoretical but practical as an operational scheme involving a clear plan for practical realization of the process within oneself. It thus becomes an instrument (Yantra). There are many types and verities of mandalas depending on the nature of the central deity. The most classic pattern of mandalas are of the Dhyani Buddha. This pattern appears in the oldest tantrics, in the oldest tantrics, the mandala represents "Palace of Purity" a magic sphere cleansed of spiritual obstacles and impurities. The square of the 'sacred palace' proper is enclosed in multiple circles of flame, vajra, eight cemeteries (appears only in wrathful deities) louts, then the inner square to reach of the deity of the Mandala. It is first incarnation of Vishnu, therefore may be associated with him. Suvarna matsya, the two golden fish, symbolizing beings rescued from the ocean of misery of earthly existence. It is also one of the eight auspicious sighns of Astamangalas. It is a three peacock feathers spread in a kind of a fan. The feathers are from the peacocks. The crown worn by Buddhist priests of Vajrayana during the religious performances is known as Mukha (ritual crown). Invariably, the crown bears images of four of the five Dhyani Buddha to establish cosmic principle. The Dhyani Buddhas represented here are Vairochana, Akshyovya, Ratna Sambhaba, and Amitabha. The fifth member Amoghasiddhi is not shown physically but is symbolized by the thunderbolt at the top of the crown. Ramnant of early fertility rites. Worshipped as divine and semi-divine beings. Frequent ornament of guardian tantric deities. Nagas have power to bring or with held rain. So, they are regarded as gods of rain. They are believed to be the protector of the law of Buddha. A Mongoose vomiting jewels is associated with god of wealth Kubera and his Buddhist counterpart, Jambala. It is believed to be the receptacle of all gems and when the god of wealth presses the animal, it vomits forth all the riches. In Tantric Buddhist iconography, the battle axe is held by ferocious deities to symbolize Iconography, it is a weapon held in the hand of Parasuram, the sixth Avatar of Vishnu, who descended to this world to fight Kshatriyas caste of warriors at the call of Bramins. Padma is a lotus which may be of any colour except blue. The blue lotus is designated by the word Utpala or Nilotpala. In Tantric works the Padma is the day lotus, while Utpala stands for the night lotus. It is regarded as especially sacred by all classes of Indians. When the lotus shows petals in both the upper and lower directions it is called the Viswapadma or the double lotus. Padma indicates purity of descent. In Buddhist tradition it symbolizes self creation (Hence it is the sign of Swayambhu). In Vajrayana it represents the female principle. White open padma appears above the left shoulder of Avalokiteswara Padmapani, his spiritual Parents are Dhyani Buddha Amitabha and White Tara. Poorna Kalash is a water vase which is full of all the characteristics of goodness as it is full of all goodness. It is treated as an auspicious object for all human beings. When the religious ceremonies are held Poorna Kalash is kept ate the centre surrounded by eight vessels. In Poorna Kalash, there will be the signs of eight auspicious symbols. A "Magic dart" used especially for the ritual slaying of human effigy of foe. It is exclusively Buddhist praying instrument which always bears the mystical word "OM MANI PADME HUM" numbering six syllables in the mantra of Avalokiteswara. The syllables are carved outside the wheel as well as kept inside the wheel printed in the paper in numerous numbers. When it turns one round it means the mantra is read how much mantra has kept inside the wheel. It is a symbol of transcendental wisdom accompanies both Buddhist and Hindu deities such as Brahma, Manjushree, Sarswati, Prajnaparamitta, Avalokiteswar, Vasundhara associated with wisdom, learning and arts. The book is sometimes placed on louts. In Buddhist iconography, the Pustaka as a symbol represents the Prajnaparmita, treaties on transcendent wisdom supposed to have been given to the Nagas by the Buddha to guard until mankind had become wise enough to grasp its profound truths. An offering vessel; a symbol of Vishnu. In Hindu tradition, the conch shell seems to have been extensively used in wars by ancient Indian. The white conch shell whose humming sound proclaims the glory of the saints. It is especially given as a symbol to the gods as the sound vibrated through a shell penetrates far and wide. It represents Dharma which protects like a shield. It is an endless knot. It is also considered luck knot, life knot or love knot. Sukunda is an oil lamp with combination of lamp and oil container. It is made of metal in artistic design. Oil was stored in the main section of the large pot and burnt in the bowl beside the neck with the aid of a wick. The filling of oil was done by a metal spoon known as Sumicha. Sukunda is the most important object for every religious and social performance. There must be the inscription of Ganesh in it, whose presence is always needed for the performances as the god of bestower of success. It is a Hindu sun god. In Buddhism it is associated with moon as symbol of basic unity of the apparently different relative and absolute truth; appears separately in the upper part of thang-kas. It is a special symbol of Akashgarbha. Used both in Hinduism and Buddhism as a symbol of the Law. It is also an auspicious sign (Swasti in Sanskrit is well being). It is one of the sixty five marks of Buddhahood found in the imprint of Buddha's foot. As a Buddhist symbol it represents the esoteric doctrine of Buddha. It symbolizes the three fold Jewels namely Buddha, Dharma and Sangha. The meaning of these there fold jewels Buddha, Dharma and Sangha is title signifying "The Enlightened" or "The Awakened", Buddha, the doctrine and community propounded by Siddhartha Gautam. It is the name of the text which expound the mystic philosophy and the principles of action leading to the attainment of "Enlightment" i.e. the state of mind of total independence from the bonds of existence in the span of one's life. Elongated petals, blue, characterizes the Green Tara, consort of one of the Dhyani Buddha. It is designated by the word Utpala or Nilotpala. In tantric works Utpala stands for Night lotus. It is the special symbol of Manjushree and Green Tara. VAJRA (Thunder Bolt) The thunderbolt or diamond that destroys all kinds of ignorance, and itself is indestructible. The Vajra is symbol of Indra also. In tantric rituals, the Vajra symbolized the male principle which represents method in the right hand and the Bell symbolized the female principle, is held in the left. Their interaction leads to enlightenment. Also the Dorje or Vajra represents the "Upya" or method Tibetans name Vajra as "Dorje". When two thunderbolts are crossed it is called a Viswa Vajra. It is the emblem of Amoghasiddhi. In Buddhist Tantra the word generally designates Sunya or Void which cannot be cut, cannot be destroyed but which destroys all evils. YAB - YUM Yab - Yum is a Tibetan word consisting of two particles yab and yum. The word 'Yab' in Tibetan means the 'honorable father' and 'Yum' means the 'honorable mother'. The combined word therefore, means the father in the company of the mother or in her embrace. YANTRA Yantra is a nucleus of the visible and knowable, a linked diagram of lines by means of which visualized energies is concentrated. There are different kinds of Yantras and Sri Yantra is the Great Yantra. Other lesser yantras (Om yantra, Kali yantras, etc.) are obviously segments out the all embracing Sri yantra. Yantras may be made in permanent form of many substances. The most important is rock crystal. Its clear colourless substance which can be shaped so as to focus light at its apex in a very good emblem for the all, inclusive substance of fundamental reality just as colourless light includes all the possible colours of light. So crystal can serve as analogy for the substance which includes all substance.